Langford Tool & Drill Co. / Mason Cutters provides commercial customers in Minneapolis the skilled craftsmanship they deserve each completed in a timely manner and safely. When it comes to concrete cutting, drilling, and sawing, we know our way around. Our many years of experience can lend its hand to any project you need done, each completed in a timely manner. Whether you are looking to drill small utility holes or need help removing floor structures from multi-story buildings, we are here for you. There is no job too big or small! We have all the necessary equipment to saw doors, windows, and duct openings up to 48 inches of reinforced concrete. We can also easily drill holes up to 60 inches in diameter through any thickness. 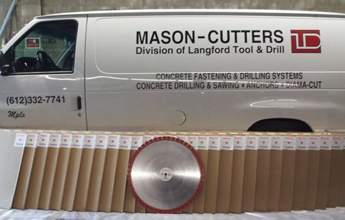 When you are looking to cut some concrete yourself; Langford Tool & Drill Co. / Mason Cutters also offers a wide variety of tools, such as diamond product saws, power tools, and more.